Heat the oil in a large saucepan, add the ginger, chilli, garlic, onion and lemon grass and cook gently for 4-5 minutes until softened without colouring. 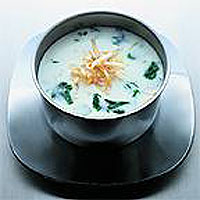 Add the coconut milk, stock, beansprouts and pak choi and simmer gently for 10 minutes until the vegetables are tender but still retain some bite and colour. Add the lemon and lime juice and coriander leaves. Season to taste and serve in deep soup bowls. This soup can be used as a base for an interesting main course by adding chunks of prime cod fillet, scallops or prawns, and mixed vegetables such as sliced red or yellow peppers, shredded chinese leaf and ribbons of salad onion.